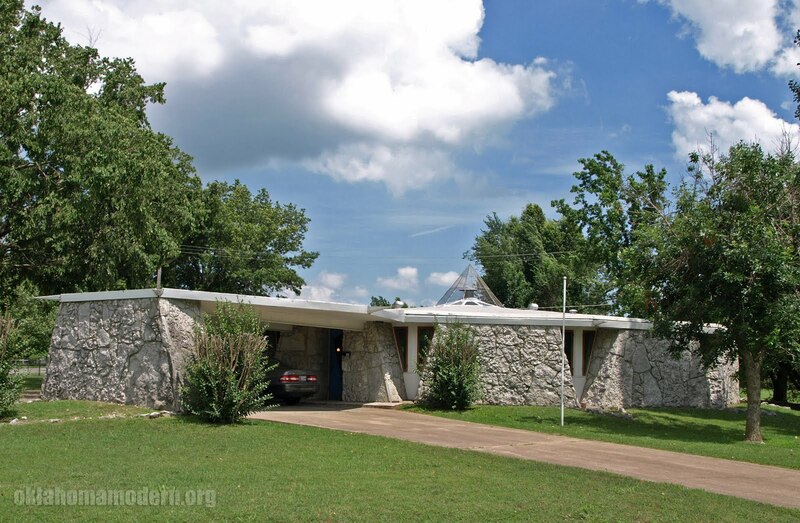 We were recently surprised to learn about a Goff-designed home just an hour away from Tulsa in Vinita, Oklahoma. Vinita is probably best known to OK Mod readers as the home of the Glass House on I-44, also known as (shudder) the World's Largest Largest McDonalds. 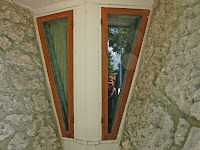 Anywho, turned out the Goff house was on the market, and the owner was more than happy to let us have a look around. We took a short drive up the turnpike one Sunday afternoon to meet the realtor, snap some pictures, ask some questions and enjoy another one of Bruce Goff's unique creations. 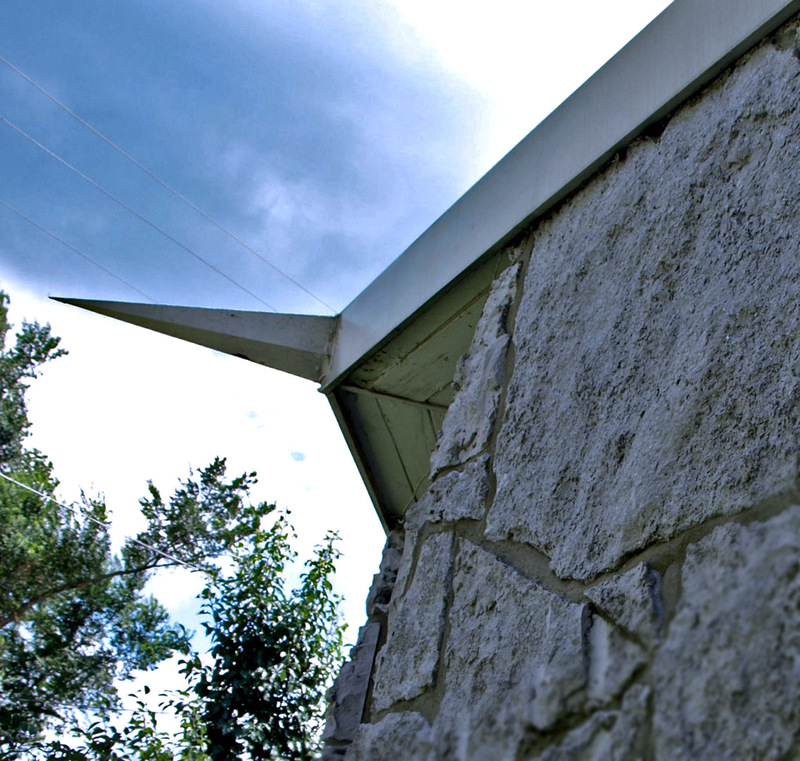 The home is known as the Adams House and was built in 1961. 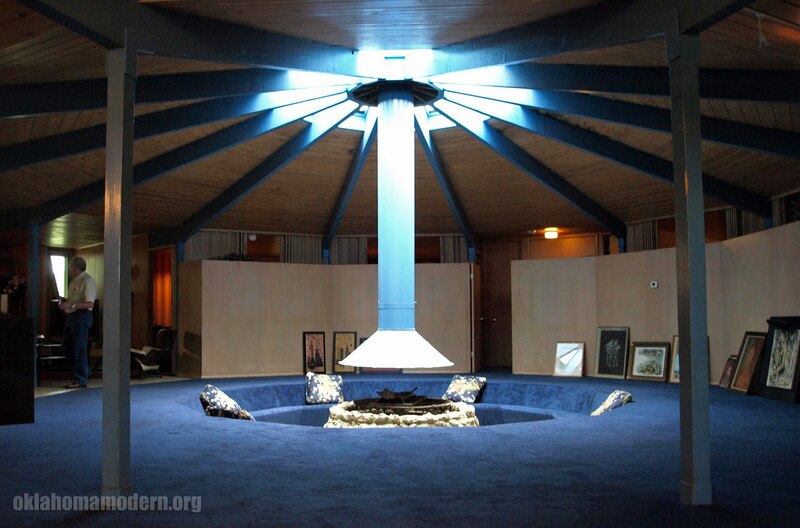 The 3,700 square foot home is arranged in a circular floor plan with a large sunken "conversation pit" at the center. Rising up from this pit is a large metal fireplace, its chimney surrounded by skylights, which dominates the entire house. Rooms surround the perimeter with folding accordion doors acting as walls. To maintain some semblance of privacy an inner ring of closets separate the central living area from the bedrooms. 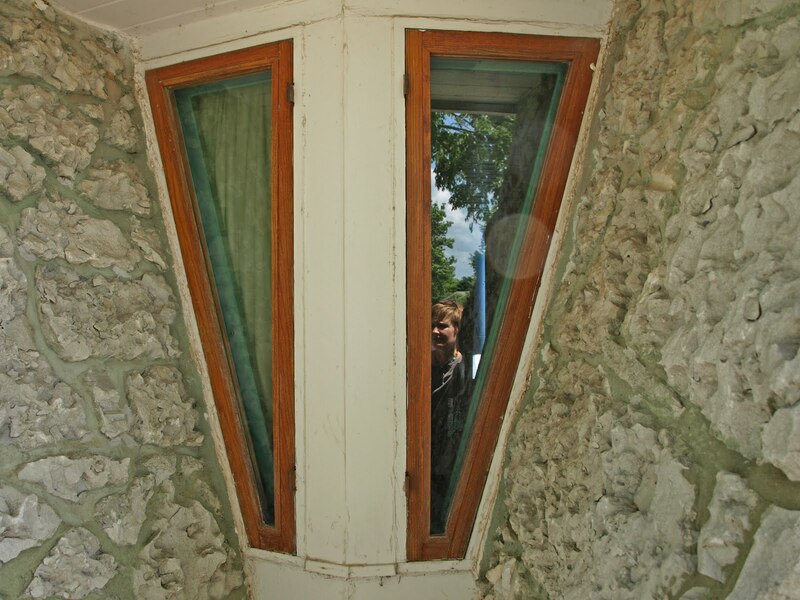 Outside, the house is rock with triangular insets for doors and windows. Much of the stone is set to show off its drill marks, and numerous fossils are visible. The nearly flat roof extends over the carport and features a cone-shaped screen over the central chimney. The rain gutter around the perimeter of the roof features sharply pointed spouts that had us wondering how far the water might be flung during an Oklahoma downpour.This 12-sided house was designed during the time Goff had an architectural practice in Bartlesville. The final version we see today was not the original design- not uncommon for residential projects by this eccentric architect. The constraints of finances, materials or good old-fashioned practicality often sent Goff back to the drawing board. It's also worth noting the current owner claims to have the blueprints for the house! Structurally the house appears quite sound. Not surprisingly there is some evidence of leakage around the skylights encircling that central chimney. But it appears to be unaltered from the original 1961 design and waiting for an appreciative owner to take over stewardship of this remarkable house.